Suja™, meaning Long Beautiful Life, embodies the promise that flows from the cold-pressured beverages it delivers in each and every bottle. Four diverse San Diegans from different walks of life came together in the most unexpected of circumstances to form what is now the fastest growing cold-pressed beverage company in the U.S.
And, it all began from a shared dream to help people everywhere transform their lives through conscious nutrition. All of Suja’s juices are certified Organic, Non-GMO & Kosher and are processed using cold pressure (also known as High Pressure Processing or HPP) to kill harmful bacteria while preserving nutrition and taste. With a wide range of cold-pressured organic offerings, Suja™ has a juice for every lifestyle. Packed with fruits and vegetables, Suja Classic is a convenient way to drink the daily nutrients your body needs and maintain overall health. All Suja Classic juices are USDA certified Organic, Non-GMO & Cold-Pressured. Suja Elements is a line of juices, smoothies & teas with a purpose. For every bottle purchased, 20¢ – 25¢ is donated to an important social or environmental cause through the Suja Elements Cause Collective™. All Suja Elements are certified USDA Organic, Non-GMO & Cold-Pressured. Suja Essentials are great for anytime, anywhere refreshment and are packed with vital nutrients, amino acids, omegas & antioxidants. All Suja Essentials are USDA certified Organic, Non-GMO & Cold-Pressured. The Suja Classic Fresh Start is a great way to reset your body and reposition yourself for a healthy lifestyle. This program is offered in two varieties – Original & Core. 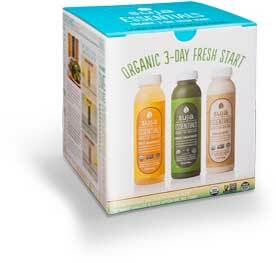 Both can be used for a 1, 3 or 5-day program, each consisting of select Classic juices. The Suja Essentials 3-day Fresh Start program is a hydration and whole food centered plan created to eliminate anything that doesn’t make you feel your best. 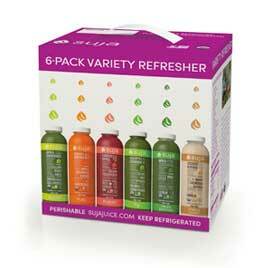 A meal plan and 9 Suja Essentials juices are included. Available exclusively at Costco.